An especially prominent figure in Hopi myth and ritual, the vibrant singing butterfly girl featured on our Native Artists collaboration tee is a powerful Hopi Warrior. Poli Mana, as she’s more formally called, was a brave defender of her village and is looked up to as a role model by young Hopi girls. This Hopi bear graphic, designed in collaboration with Native folk artist, Gregory Lomayesva, is a warrior and symbol of good. Due to the bear’s innate fierceness and ability to continue defending itself even when injured by its opponent, many tribes believe it to have healing powers. Thus, warriors have been known to wear necklaces of bear claws as a source of power, strength, and protection during battle. One of the most important clan animals among Native tribes, the bear also appears as a common motif in many religious ceremonies. As Shawnee tradition has it, there are three figures that control weather. The most well known of the trio is the Thunderbird—a bird so enormous it’s said to be able to carry a whale in its talons like an eagle would a fish. Ruler of the sky, the Thunderbird protects the Shawnee people by throwing lightning bolts, with the blink of an eye, at the Great Horned Serpent and other evil creatures that pose a threat to the village. Designed in collaboration with Absentee Shawnee-Seminole painter, Benjamin Harjo Jr., this colorful geometric turtle is a sacred symbol of the Shawnee-Seminole people. Legend has it that long ago, when Earth was only water, there was an island that sat above it. In the middle of this island was a tree that served as a source of light to all its surroundings. One day the tree was uprooted, and a large hole was left in the sky in its absence. Sky Woman, curious about the hole, peered over the edge and tumbled right through it! Down she fell, towards the water. As she plummeted downward, the sea creatures below frantically tried to think of how they could come to her rescue… if only they could dive down to the ocean floor and bring soil to the surface, they would surely be able to save Sky Woman. After many tries, little muskrat came back with soil in hand. Realizing she had nowhere to put it, turtle said, “Put it on my back, I will hold up the land and the Sky Woman.” And so the story goes of how the turtle carried the earth and the first Seminole people on his back. 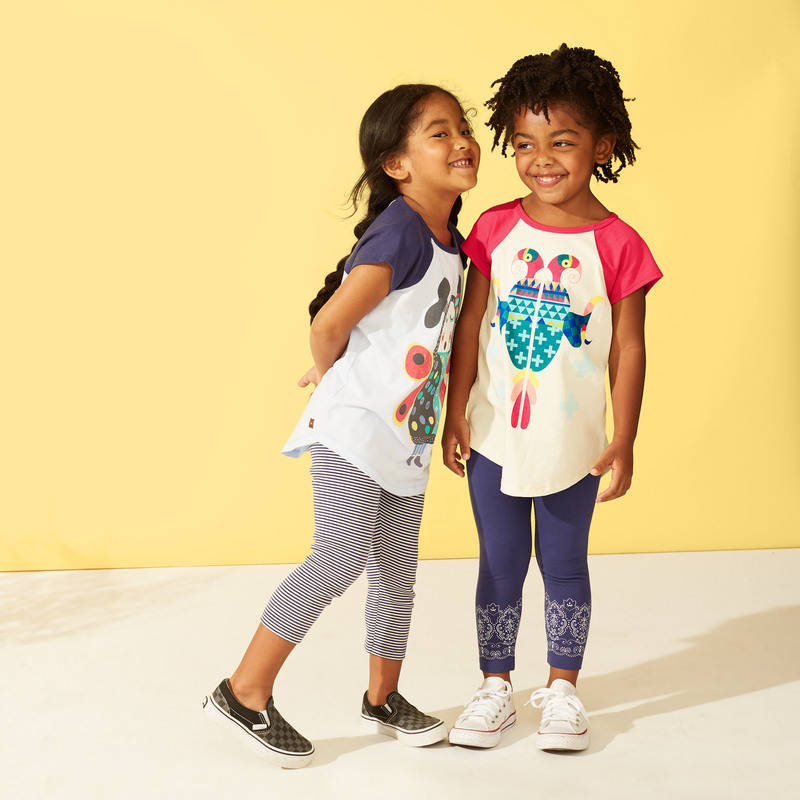 Perched on this sweet tunic tee is a parrot with colorful plumage—a gorgeous creature believed by the Maya to be born from the sun. Designed in collaboration with renowned Cherokee beadwork artist, Martha Berry, this brave little water spider risked great danger to bring fire to the Cherokee People by spinning a webbed bowl in which to transport a hot coal on her back.